This month it seems like I bought a lot. I mean, I had a lot of time feeding Mia that was spent scrolling on my phone, and quite a few things made it into my shopping cart at 4 in the morning ;) What can I say, I'm excited to be wearing normal clothes again! But, while I bought a lot, I actually had a few gift cards from my birthday in February and leftover from Christmas so I didn't actually spend very much. I was mostly on the hunt for springy pieces and things with buttons that could work easily for nursing. I'm particularly loving this Amazon find - just $19 and good quality. I've worn it at least twice a week since having Mia! I don't often buy things from Amazon, but once I hear someone else recommend a piece and see it has great reviews, I'm happy to jump on board (like my new favorite tee - just ordered the tank version too!). I just recommend definitely reading the reviews to get a feel for sizing, as a lot of things made in Asia can run really small. Amazon Waffle Tie Henley - $18.99. I love this for nursing! Definitely size up for a looser fit. Seen here. J.Crew Eyelet Tee - originally $39.95, on sale $23.70, used giftcard $0. This is another one to size up in, as the eyelet top has zero stretch. So cute in person! I originally wanted to snag it in white or blush but am glad I went for the red. I don't have anything like it in my closet and the color is so pretty. LOFT Striped Tee - originally $29.50, on sale $15.93, used giftcard $0. I've really been feeling fun stripes lately, and the vintage feel of these is so fun. It also has a shirttail hem which is really flattering, but I also love the idea of tucking it into higher waisted pants or shorts for summer. I also always say to size up in LOFT tees as they tend to shrink in the wash.
Shiraleah Pom Tote - $35.00. I ended up ordering this because it was such a good deal, but am not sure I'll keep it because I also managed to order this tote (ahem, in the middle of the night). The second one hasn't come yet, so I'm going to wait and see which I like better. I hadn't heard of this brand before, but they have some really cute accessories at low price points! J.Crew Factory Faux Wrap Dress - originally $89.50, on sale $35.60. I loved the chambray faux wrap dress from J.Crew Factory last summer, so I was excited to try it in a print. This one actually has a wrap top with a button closure, so it'll be great for nursing. I got an XL in this but probably could have sized down to a large thanks to the elastic waist. I was going to try it on in stores to compare but my local store was sold out, so I'm sticking with the XL. J.Crew Chambray Dress - originally $98.00, on sale $58.80, used giftcard $0. Okay, not going to lie, this definitely is not the most flattering thing on me on its own. It could stand to be taken in several inches in the small of my back. But, I am loving the way it looks layered with cardigans and jackets, and the full button front will work great for nursing, so I decided to keep it anyway. I would not suggest sizing down if you have a full chest, since then the buttons would pull. J.Crew Factory Tie-Sleeve Button Down - originally $59.50, on sale $28.40. I told Jeff this was new (because the one time I wore it I managed to splatter ramen all over it ;) and he was like, really? Because I may or may not own several super similar blue striped button downs. Loving this one though, the tie sleeves are so cute and I like the collarless neckline. Seen here. LOFT Duster Cardigan - originally $69.50, on sale $37.53, used giftcard $0. I ordered this for chilly spring weather, and then proceeded to wear it three days in a row! I am looking forward to pairing it with white jeans when it warms up a little more. The only issue with really long cardigans like this is they look a little silly with all of my coats since I don't own any ankle length coats. Definitely only wearing this out on days I can afford to skip a jacket! Vineyard Vines Woven Earrings - originally $42.00, on sale $31.50. I loved all of the woven earrings that popped up last summer but never snagged a pair, so when I saw these on sale I couldn't resist! They are slightly heavier than I like in a statement earring (I have wimpy ears that can't handle anything) but definitely still wearable. I've already spent a good chunk of my budget so far for April but things haven't arrived quite yet. I saw these Chloe espadrille dupes and immediately had to order them - so cute for spring! I got them in pink but if you like the other colors they're also available here and here at a lower price. 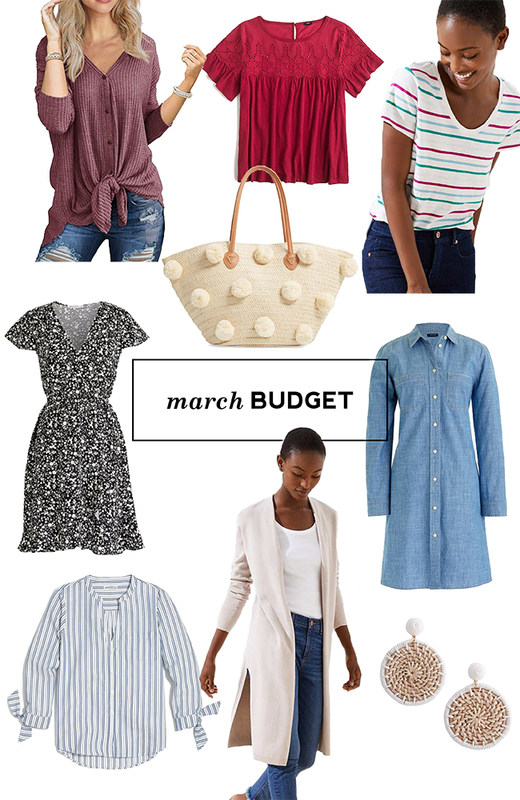 I'm basically still on the hunt for the same things for April, although I may be shopping for new jeans now that I'm a regular size again!